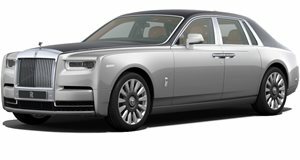 And we thought the Rolls-Royce Sweptail looked extravagant. Rolls-Royce is often accused of making cars with designs that are evolutionary, rather than revolutionary. That was certainly the case with , which, aside from a few minor changes, looked nearly identical to its predecessor, despite riding on an entirely new aluminium platform. Enter render artist Sergey Dvornytskyy, who has imagined what would happen if Rolls-Royce decided to steer in a more radical design direction for its luxury cars in the future. Called the Rolls-Royce Exterion Concept, this futuristic luxury sedan makes the look tame by comparison. Speaking to , the artist says the Exterion Concept is inspired by “the wonderful world of Syd Mead illustrations and the latest trends in Rolls-Royce design”. He describes it as “the ultimate luxury electric vehicle for the futuristic world of autonomous driving” and “a luxury yacht for roads of the future.” The front fascia looks familiar, but here the grille serves no cooling function and is merely for show since the Exterion is autonomous. To compensate, the grille has been been decorated with diamond accents. Complementing the autonomous technology is a complete lack of windows, allowing occupants to relax inside the lavish cabin. Dvornytskyy hasn’t provided any renders of the imaginary interior sadly, but it would have to be absurdly luxurious to live up to Rolls-Royce’s reputation. Traces of the luxury automaker's old one-off coachbuilds can be seen in the Exterion's proportions such as the extended hood and oversized wheels, but we’re not quite sold on the huge side skirts and protruding front and rear bumpers that make it look like it’s wearing an ill-fitting aftermarket body kit. The lack of clearance between the wheels and the arches would also make it impractical on the road.